Full referencing - including but not limited to:- a full credit check, employers reference, landlords reference and 6 months bank statements review. Deposits – Held for the duration of the tenancy and registered with a deposit protection scheme. Generally equal to one month’s rent, although this may increase depending on circumstances. 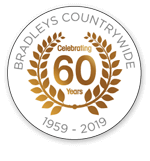 Bradleys Countrywide are regulated by The Property Ombudsman and register deposits with the Deposit Protection Service. All figures quoted include VAT at the prevailing rate.